Why has Israeli Soldier’s Photo Sparked More Outrage than Israeli War Crimes? 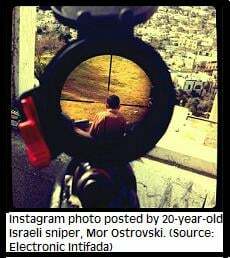 The Instagram photo posted by an Israeli soldier showing what appears to be a Palestinian child in the crosshairs of his rifle has sparked outrage, as it should. Ali Abunimah was the first to report on this at the Electronic Intifada and it has since gone viral with major news outlets picking up the story. This photo is not only disgusting but it’s also symbolic of the callousness with which Israel views Palestinian lives. Still, I find it unsettling that this picture has elicited far more outrage than the routine killing of unarmed Palestinian civilians ever has. Where was this outrage last month when Israeli soldiers shot dead four unarmed Palestinians, among them children, in under a week? Where is this outrage when Israeli soldiers drop bombs on Palestinian babies, use Palestinian civilians as human shields and massacre entire families? This picture is not, as some would like to believe, the product of one bad apple among many good soldiers. It’s the product of decades of dehumanization that is inherent in military occupation. Just ask Breaking the Silence, a group of former Israeli soldiers committed to shedding light of the routine abuse of Palestinians by Israeli soldiers. “This is what occupation looks like. This is what military control over a civilian population looks like,” wrote one member of the organization in a Facebook comment about the Instagram photo. Yes, this photo should certainly spark outrage but so should the war crimes that precipitated it. In fact, I would argue that anyone surprised by the photo is absolutely clueless about what occupation and dominance over another people means. I recall a similar uproar in response to American soldiers keeping body parts of Afghans they murdered as trophies. The same type of controversy erupted when a video surfaced showing US soldiers urinating on Afghan corpses. Meanwhile, just last week a NATO airstrike killed 10 Afghan civilians, including five women and four children, and barely anyone noticed.